Understanding where the audio signal currently is, and where it will go, is a key aspect of working on a large format mixing console. It makes all those knobs and buttons much less intimidating if you know what is creating the signal, what the signal is passing through, where it is being processed, what is processing it, and how that process is affecting your audio. If you wrap your head around signal flow all the other concepts of frequency and dynamics and equalisation will fall into place because those concepts are inherent in understanding the devices and components affecting signal flow. Metering vs Monitoring Signal Flow. On large console desks it is helpful to understand the difference between metering and monitoring. On most modern inline consoles a single, mono channel input/output module (Channel Strip) carries two distinct and separate signal paths – a channel path and a monitor path. A large mixing console can and will have an enormous amount of routing possibilities that far exceed this simple overview, once you start bussing (combining) signals, and sending them to outboard gear and routing them to other channels for processing, the complexity can multiply exponentially. To keep things simple, the following explanation uses an imaginary mixing console/desk with exactly one channel and an extremely basic signal flow. Channel equalisers, compressors and gates are ignored for simplicity’s sake. 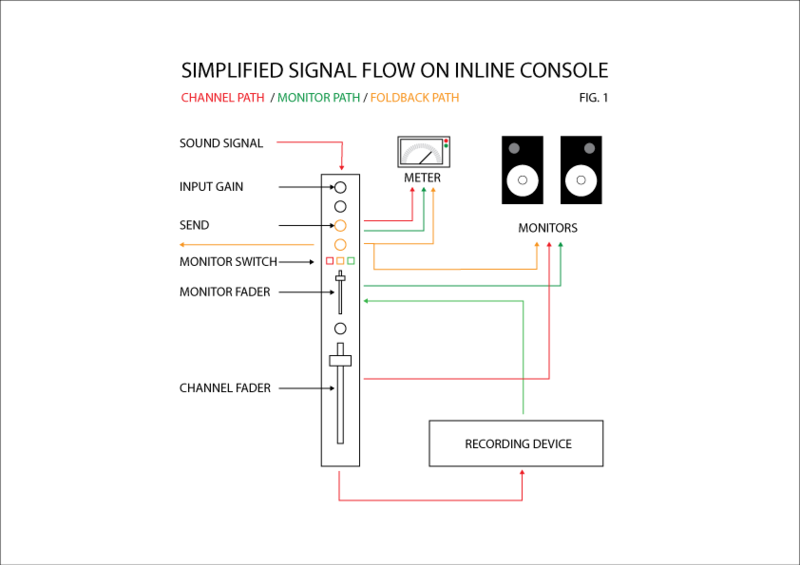 A (very) simple diagram of the signal flow through an inline console. At the beginning of a session, sound signals from the studio live room can be metered before they are heard. Meters are used to check that the signal is reaching the desk on a chosen channel and that the input levels are healthy. Metering does not necessarily involve hearing anything, initial adjustments can be made without listening, and this can be quite counter intuitive to a beginner. On larger consoles there are also a number of states that a desk can be in for different purposes, mix mode, recording mode, broadcast mode, etc., so metering also includes understanding, at a glance, what mode a desk is in, and how that mode affects signal flow and various inputs and outputs. Metering is very important because once you start recording/mixing you can be working on several layers of controls and routings, and the only way to check on certain a signal path is to check the relevant meter metering it. Once we have metered our signal, and set optimal gain levels – typically averaging around O VU on an analogue desk and between -18 and -12 dBFS on a digital console with peaks no higher than -6 to -3 dBFS – we can now listen. At this point we are checking for unwanted artefacts and distortions, and setting the tone, timbre and dynamics of the signal. Even during a very basic recording session, an engineer is usually working with three mixes simultaneously, and since only one of these mixes can be heard clearly at a time, metering what the other signals are doing becomes a necesstiy. A (very) simple diagram of the channel path signal flow through an inline console. The signal coming directly from the studio/musician will go into and through a channel on the console. This signal path is called Channel Path. We can meter it and we can monitor it. Typically the fader on Channel Path is at unity gain and the signal is set to hit the meters at optimal levels, without clipping. This can be done via mic placement and/or gain input adjustments. This Channel Path signal is in the console BEFORE it reaches the recording device. On Channel Path you are listening to the signal on the console itself – i.e. you are listening to the source sound and the sonic effect the desk is having on it – this is very important to understand for later in the process. From the console, the signal traveling through Channel Path can be routed into a respective channel on a recording device like a Tape Machine or a Pro Tools HD rig (Tape), pass through the recording device itself, and then get routed back onto the desk into the Monitor Path. A (very) simple diagram of the monitor path signal flow through an inline console. The signal that comes back onto the desk from “Tape” is monitored via the Monitor Path. In our imaginary studio this is the same single channel we have. So now there are two signal paths to meter and monitor on one strip – the signal coming from the musician into the desk (Channel Path) and the signal coming from Tape back onto the desk (Monitor Path) this requires switching or splitting between which layer of the channel strip we are metering or monitoring. It is common, for example, to meter Channel Path while listening to Monitor Path. As you can see it is very important to grasp where and when your signal will be at any given time, and more importantly WHICH signal you are metering or monitoring. The Monitor Path is the mix we generally want to listen to because the simple fact is that the sound coming from the musician will change as the signal travels through the microphone, down all the wires and components, through the console channel, through analog to digital conversion, and back to the console and speakers. As a result, the Channel Path and Monitor Path often sound very different from one another. In theory, one aims to have very little difference between the sound of the Channel Path and the Monitor Path – the thinking goes that if they are as close as possible to each other, you are capturing the truest, uncoloured representation of the audio coming into the desk from the musician. The Monitor Path signal therefore will give you the closest approximation of how the recording will sound, so we use the meters to check that we are listening to the correct signal path to make sure we are hearing what is “going to tape”. A (very) simple diagram of the foldback path signal flow through an inline console. The foldback mix is probably the most important mix to get up and running as quickly as possible. This mix is the one sent back to the musicians in the live room so that they can hear themselves and each other. This is quite often set up to be run from dedicated sends on the desk. A foldback mix can make or break a recording session and you really, really need to know where your signals are so that each musician can be fed a desired signal at a desired level quickly and efficiently so as not to disrupt the creative flow of a recording session. It’s also the part where an engineer’s knowledge of signal flow is most tested. The foldback mix can be sent from either channel path or monitor path, but there are any number of requests and needs from a recording band and any number of ways to route it and add effects on one channel but not another. Signal Flow lies at the heart of audio engineering. Without a firm grasp of where a signal is coming from, how a signal is moved around a system, and where it will be at any given time within that system, you will be tearing your hair out trying to figure out why you can only hear guitars on the left channel, why the drums are dropping in and out of the mix for no apparent reason, and all the while trying to figure out a way for the bassist to have a direct line into the desk via his homemade “vintage” pedal, which for some unknown reason uses bantam to RCA cables, and the vocalist yelling at you because the headphone mix is only coming through on one side of the headphones he only plugged in halfway. Tags: audio engineering, channel path, foldback, fundamentals, How does a big mixing desk connect to a DAW?, how does a mixing desk work?, monitor path, processing, signal flow, What do all those buttons on mixing desk do? « How to Listen Like a Pro.